Today we are hopping along sharing projects that the Pretty Pink Posh DT and friends have made using these fabulous new products. Isn't this Stitched Film Strip fantastic? I couldn't resist using it along with this adorable penguin image for Christmas. Time to hop along now. You have until 11:59 PM PDT on 8/10/14 to leave a comment for a chance to win one of TWO $25 Gift Certificates to the Pretty Pink Posh store! Can you believe this line up of designers? Enjoy the inspiration! HE HE! So cute! Love the penguin popping out at different directions. That die is perfect!! Love it and your sweet holiday card! Thanks for the chance to win such a great prize!! Very, very cute Christmas card! Love this die! This card is so cute! I love the red and white! Such a cute card and a great gift for xmas! I love this card! 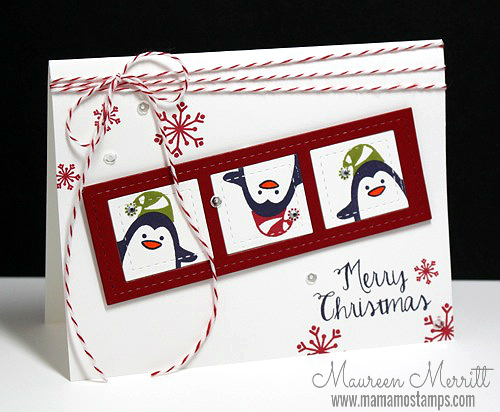 The penguins are so cute and the design overall is merry and bright ~ perfect for the holidays! This is ADORABLE! Oh my, not sure I'm ready to think about Christmas yet, lol! Oh my...so incredibly adorable! That little penguin is a cutie-patootie peeking from the new die frame! Very CUte. I just may have to case this card for Christmas. Adorable card, penguins are a household favorite here. Love the twine accent. Sweet! I love your penguins in the frames!! TFS! Love the penguins and love that die! Christmas!!! Love this card!!! Those little penguins are so cute and festive!!! Awe how cute! I love it! The penguins are adorable.. beautiful christmas card..
What a fun playful card! You are getting me in a holiday-card-making state of mind!! you are making me want to break out my Christmas supplies. :) very cute card! Fabulous holiday card! Love the adorable penguins peeking out the windows. Love the idea of including the stitch box cutout into the design! thanks for sharing! Hope to win these dies, I hope, I hope! Eeek! So cute! What an adorable card. Great idea for a Christmas card. Thank you. Those penguins are perfect for this card! Love it!! Your card is truly inspiring. Love the dies. Awe! Love your card! The penguins are too precious, especially the upside down one. So darn cute! Super cute xmas card!! Love seeing an xmas card in august!! ADORABLE Christmas card Maureen, love it! What an awesome Christmas card! Love that little penguin! What a great Christmas Card and using the new stitched film strip and is great combination! Such an adorable holiday card! I absolute love the little penguins! This is a great card! Thanks for sharing! Very fun card, love the filmstrip die and the penguins. So happy! The images made me smile. Such a fun and happy holiday card! I had to laugh when I saw this card. The little penguin peeking in from the top of the frame is darling. Christmas is coming soon and we'll be needing cards like this. thanks for sharing. Those penguins are too cute lined up in the windows! Wow! Cute cute! Love those little penguins peeking behind the frame. Such a fun, cute card! I love that you stamped one of the penguins upside down. The addition of the pretty twine makes it perfect. My film strip die has just been ordered. Thank goodness! Love this card! this new die is awesome! Oh so adorable..... love everything about this card!! PENGUINS!! Love the card, and would love to know where you found the cute stamps. TOO cute!!!! I like it. Thanks for sharing. Such a cute and cheery card! I love the penguin, but what got me was the red snow flakes and your twine angled out! Such a cute card!!! Love the penguins!!! Thanks so much! Such a fun, cute card. Great idea. So cute...love the film strip die! Fantastic Christmas card Maureen! Love the penguins. What a clever use of the filmstrips and the penguins are adorable. Cute Christmas card! YES, the film strip die is FANTASTIC! That penguin is so cute. So adorable! Love this new die and can see using with many fun images! The penguins are so cute. Great card for Christmas. Super cute Christmas card! Love that little penguin! How cute! Love the new dies. This card is so adorable and so pretty! Thank you for sharing! LOVE the penguins, and with them going in different directions there is so much movement on the card! What an adorable holiday card! Adorable Christmas card. So glad you all are sharing how to use my new dies. Really cute !! It's a cute idea to use small stamps. Your carda are so cute! Must CASE thos one. Maureen, I love your adorable little Christmas card! So sweet! So fun and cute! Love this card for the holidays. What a fun Christmas card!!! I love this Stitched Film Strip die! It'll be so much fun to let all kinds of critters peek through the windows. In fact your penguins are really cute! The cutest christmas card ever....Love it!!! So much fun! Gorgeous card! This is so cute! I love penguins!! Wow! Love that you used this die to create a Holiday card. I am not thinking about Christmas until October, but this sure is a cute card! How cute. These die cuts do come in handy.! Sweet Christmas card. Love the stitched filmstrip die. AHHH! No winter yet! :) This card is cute enough, it makes me not really mind, though. Cute card. Love the design. Mo,your card with the penguins in the Stitched Film Strip die is so cute. This would make a cute card to give to younger children or grandchildren. Love it! That is an adorable penguin card Mo! 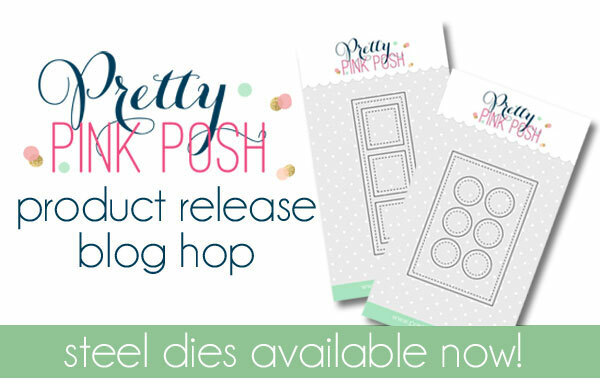 The Pretty Pink Posh dies are so much fun! I love love love your Christmas card! So adorable. So cute!! :) I am feeling the Christmas Mood. What an adorable card! The penguins are just so cute!! OMGsh, just found my inspiration for my Christmas card! Thank you! That is a great card and those penguins are so fun. TFS. Cute use of the filmstrip die! Oh how I love Christmas and this card is outstanding. great use of the new die from PPP. Such an adorable card! Sweet and festive. Thank you for the inspiration! Such a cute card. I just love the penguins! Thanks for the inspiration! Very nice ideas on the cards. What a great card for xmas! Those penguins are the cutest!!! Cute and easy way to make christmas cards! I'm loving that stitched film strip die too,gorgeous for having little critters like that cute penguin peeping out! Christmas! So glad to see a lovely holiday card. You have inspired me. Thank you for sharing! such a fun and cute Christmas card!!! This is a gorgeous card. Colour combo is fab and so are the penquins. Thanks for a chance to win. This is such a fun and playful Christmas card! Those penguins inside the stitched filmstrip are just too cute! Such a cute card ! I love those penguins ! I love the little peeking penguins! You guys are doing a great job with this die...I love your penguins...great card!!! OMG & LOL your card is tooo oooo cute!! I love it..talk about being super clever with a stamp OMG and your coloring skills so rock!! Love the way you used the new die. I love this . It is such a cute Christmas card. The die has so many possibilities . Thanks for the inspiration. The penguins in the windows are so sweet! I love this card! This is my favorite card of the blog hop so far... that penguin is just too darn cute!! Love, love, love this card. Such a cute Christmas card. Darling card Maureen. Love the sweet penguins in the squares. I love these dies and was set on the picture frame one--but seeing you use it with penquins sold me! I. Love. This! This card is perfect! Great use of the filmstrip die! What a cute festive card! So sweet the peeking penguins! I love what you chose to do with the new die! Thank you for sharing! Love the Christmas theme of your card, so pretty!! Mo, love those penguins. So cute and easy to make multiples. I love the red snowflakes and the cute penguin. Love the Christmas card, the penguins are great! Oh my! I love the penguins peeking through their little windows! So adorable! Adorable Christmas card! Love those penguins! What an adorable Xmas card, feels like the penguin is flipping through the air as the camera goes off hehe...so cute. Love it. This is a really cute card for Christmas! That die works for everything, doesn't it? Adorable Christmas card. Loving those peeking penguins! So cool that you created a Christmas card!! Love it! How adorable with these penguins! this card makes me excited to make Christmas cards! I love your penguin stamps with this die. What an adorable card. Cool Christmas Penguins tumbling across the snow! Love you card! The penguins are so adorable! That is one cute penguin...fun Christmas card. This card is super cute, I love the penguins! Love this. Cute penguins in all directions. Thanks. This is my favorite so far. Love also how you made the penguin look different. Such a cute card! I would love to win! Great release. I love the creations. Great card and dies used from PPP!! This card is absolutely adorable!!! I love the placement of everything on it, including the new dies. Oh my goodness!! Those little penguins in the film strip are absolutely DARLING!! Love this! your card is sooo CUTE. LOVE that penguin. Thanks for sharing. I can see that middle penguin sliding down the hill on his snowboard and doing an invert! Fun card! This is so sweet and what a wonderful idea for a Xmas card. Might have to CASE this one!! Please feel free to send this one to me for Christmas LOL. I love it! Your card made me giggle. It's so cute! Thanks for sharing! What a fun Xmas card. Can't help but smile when you see this card. Love the playful penguin! Adorable! I just realized we're not that far from Christmas. Thanks for the reminder and fun inspiration. Such a cute card!Thanks for sharing! I love the penguins! Very cute!